FAT SOURCES: WHY DON’T I EAT OIL? FAT SOURCES: WHY DON’T I EAT OIL? ??? ?What is the difference between consuming fat in the form of oil OR whole plant based foods. I consume carbs, protein and fats in almost every meal, but I try to get these from whole foods. For example my favourite fat sources are things like: avocados, tahini, nuts, chia seeds, and flaxmeal. You can see that half a small avocado has the same amount of calories as only 1 tablespoon of extra virgin olive oil. You can also see that their fat content is pretty similar, however their fibre content and size/weight varies greatly. THIS is why I choose “whole” fats over consuming oils in my foods. The fibre, water and nutrient content of fats such as avocados keeps me fuller for longer, and helps to satiate me more. When cooking with oil or even drizzling it over salads, it is very easy for the fat & calories to add up very fast due to its concentration. Yes oil can come from whole healthy fats “olive” oil, “peanut” oil, “coconut” oil but the process of turning those once healthy whole foods into oils means stripping them of nutrients and vitamins leaving you pretty much JUST the fat. Avocado on the other hand contains countless nutrients and vitamins such as Vitamin A, Vitamin C, calcium, and iron in addition to small amounts of healthy carbs & protein too. Not to say I never consume oils ? of course I do when I eat out or I have a meal someone else has made me, but I don’t consume it daily. 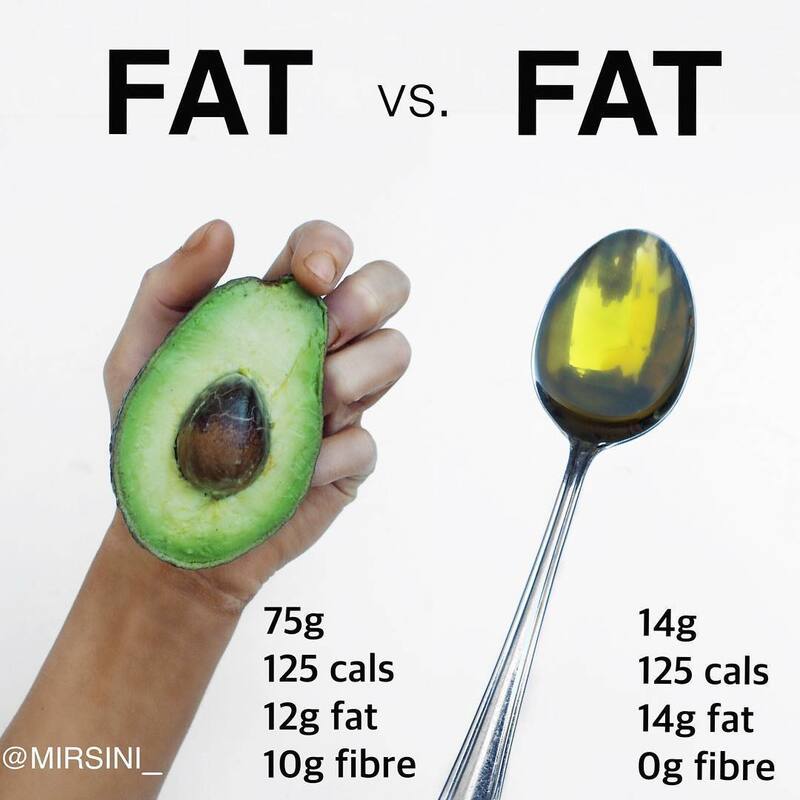 I just prefer other choices of fats ?? I know everyone has different preferences just sharing what works for me! ..what are you guys’ view on this?